Present Your Research to the World! 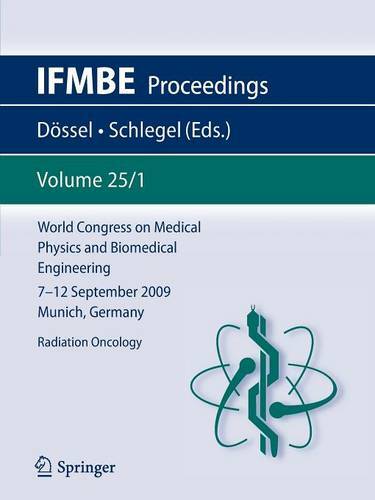 The World Congress 2009 on Medical Physics and Biomedical Engineering - the triennial scientific meeting of the IUPESM - is the world's leading forum for presenting the results of current scientific work in health-related physics and technologies to an international audience. With more than 2,800 presentations it will be the biggest conference in the fields of Medical Physics and Biomedical Engineering in 2009! Medical physics, biomedical engineering and bioengineering have been driving forces of innovation and progress in medicine and healthcare over the past two decades. As new key technologies arise with significant potential to open new options in diagnostics and therapeutics, it is a multidisciplinary task to evaluate their benefit for medicine and healthcare with respect to the quality of performance and therapeutic output. Covering key aspects such as information and communication technologies, micro- and nanosystems, optics and biotechnology, the congress will serve as an inter- and multidisciplinary platform that brings together people from basic research, R&D, industry and medical application to discuss these issues. As a major event for science, medicine and technology the congress provides a comprehensive overview and in-depth, first-hand information on new developments, advanced technologies and current and future applications. With this Final Program we would like to give you an overview of the dimension of the congress and invite you to join us in Munich! Olaf Doessel Congress President Wolfgang C.